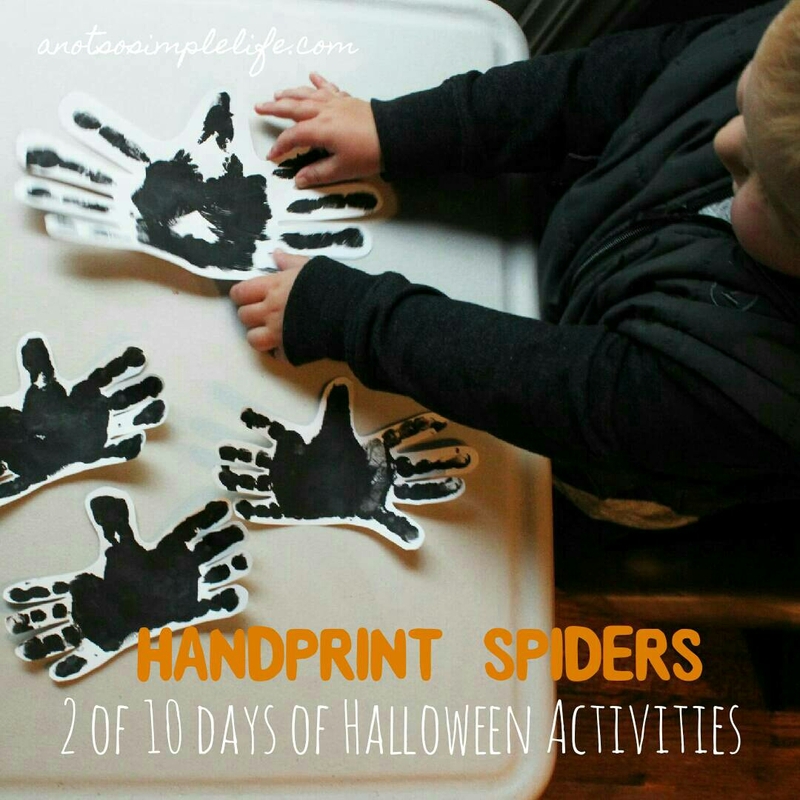 It’s day 2 of 10 days of Halloween crafts for Toddlers. My house has been a chaotic mess of paint, glue, eyeballs, glitter (I accidentally left a container where my LO could find it) and halloween stickers, but you know what? It’s been amazing! Take a look at my dining room table….I set out all of the craft supplies at the beginning of the season so it’s super easy for us to run in and grab some stuff to do a quick craft or two each day! I’m definitely going to do this all the time from now on. Halloween crafting keeps both me and the LO sane when the weather is starting to get yucky. You may or may not know, but my son was born with a cataract that was removed when he was 1 month old. We now have to patch his strong eye to force him to work his weaker eye for about 5 hours per day. Can you imagine trying to keep a patch on your 2 year old for 5 hours per day? To be quite honest, 2 is much easier than 1 1/2 but I still can’t turn my back for even a second. When we have a day that’s too gross to go outside it gets really tricky because there’s only so much fun you can have with his toys. That’s where my love for crafting has come in handy. Up until now the LO didn’t really have an interest in painting, all of a sudden he wants to do it everyday – you’ll notice a lot of these activities involve painting. My best tip, keep lots of wipes handy! 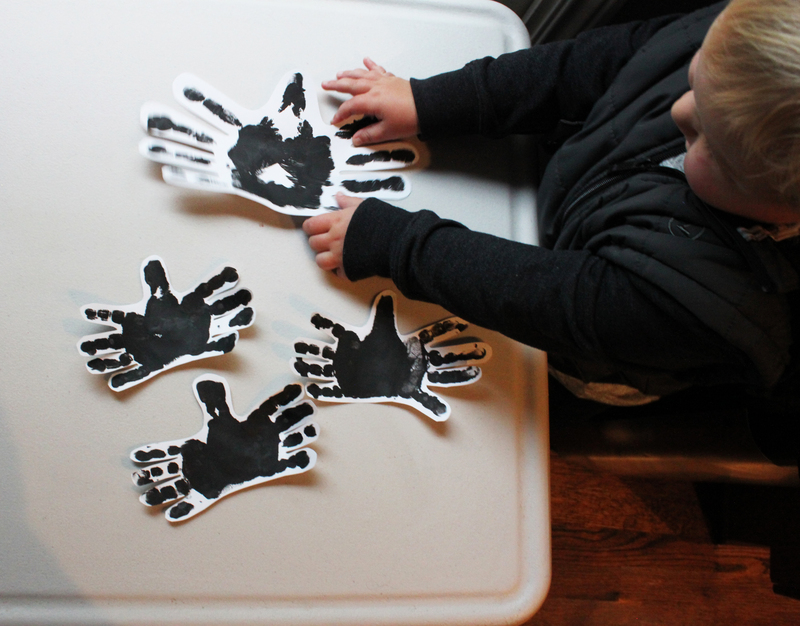 We made like 5 of these hands and we also did a “Mommy” “Daddy” and “Baby” so that we can hang a spider family on the wall. If you’re making multiples I would suggest you lay out multiple sheets of paper and get it ready. 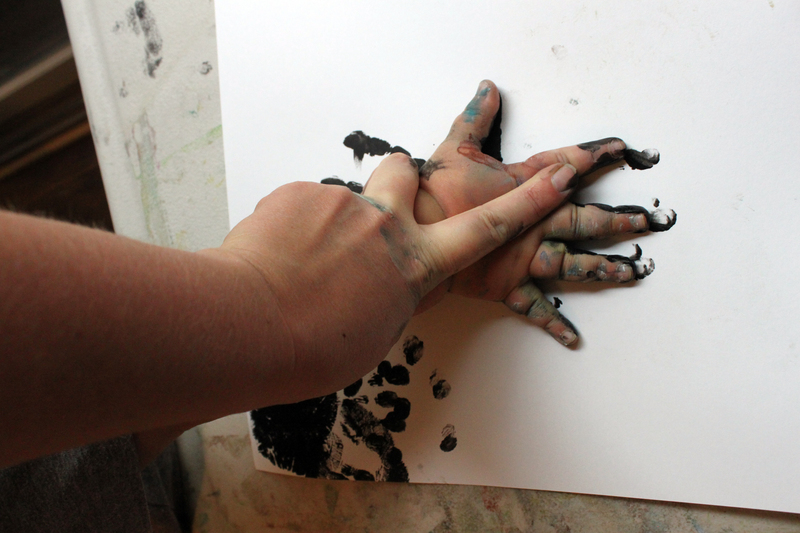 We started with our right hand – paint a sufficient amount of paint all over your hand, seriously, glob it on so that it’s thick enough that it doesn’t dry right away. Your paper should be sitting on the table in front of your LO long side running up and down. Then stamp your LOs hand at the top of the paper. We did like 5 of these so do all of the left hands first before you move onto the next hand if you can. To do the second hand flip the paper around. The thumb prints end up being the head. The palms of your hands should overlap. 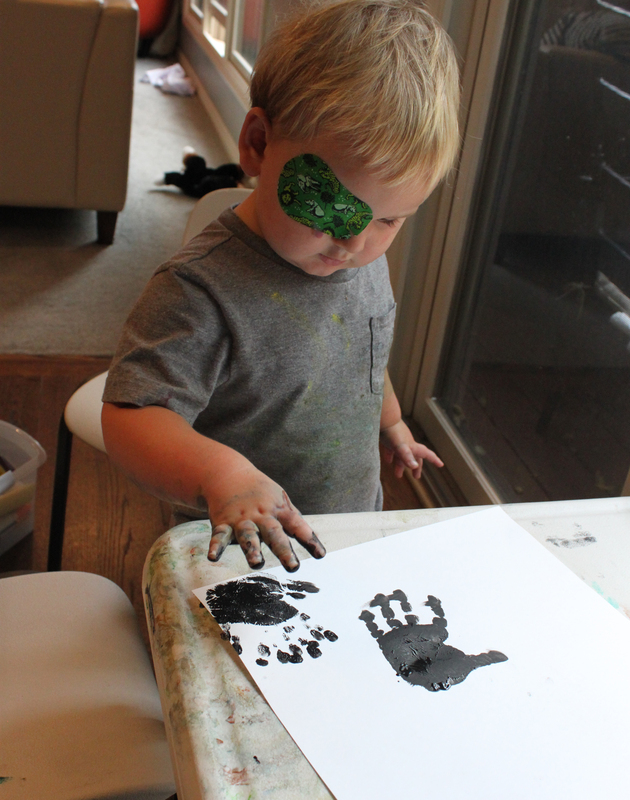 By the end my LO was covered on both hands and also painted his arms (for some reason he’s been really into that). 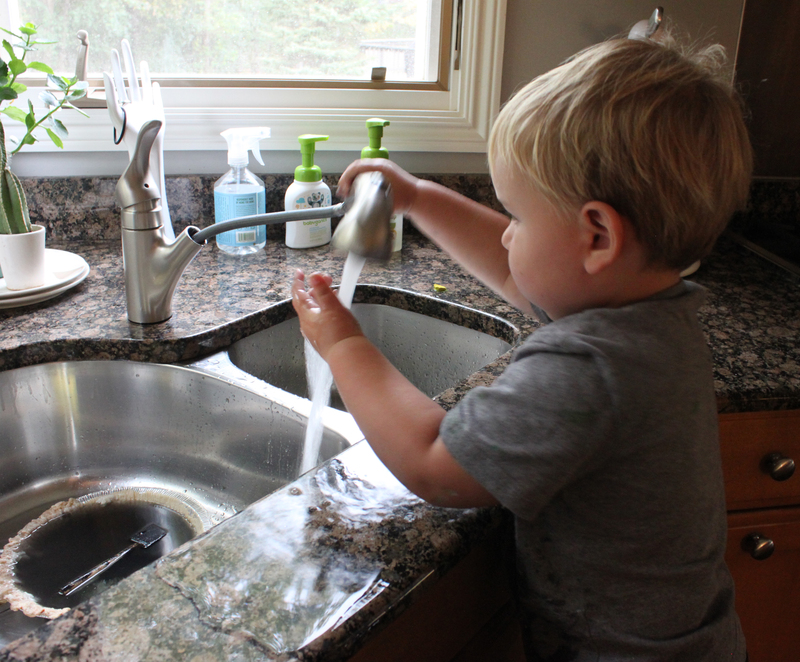 A few things I learned from this handprint activity, have tons of paper because after making handprints your LO will be obsessed with painting on his hand and will want to fingerpaint on everything (we used actual acrylic paint for this too so it can make a permanent mess if left to dry) amd 2, the cleanup at the sink is just as fun, if not more fun for the LO than the actual painting.